Remarkable Marketable Me: Celebrate Me Home~ Every day, more than 100 soldiers pass through DFW Airport on their way home for two weeks of well-deserved rest and recuperation (R&R). Celebrate Me Home~ Every day, more than 100 soldiers pass through DFW Airport on their way home for two weeks of well-deserved rest and recuperation (R&R). Every day, more than 100 soldiers pass through DFW Airport on their way home for two weeks of well-deserved rest and recuperation (R&R). DFW is proud to assist these members of the armed forces as they return home from their service in Iraq and Afghanistan. 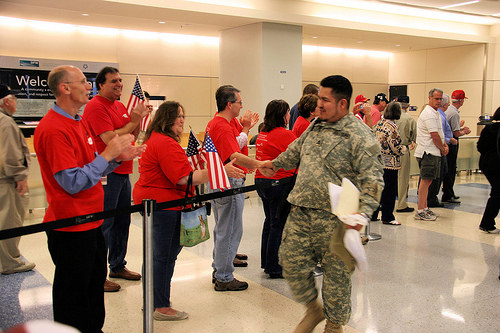 One flight of returning soldiers lands at DFW every day and the warm welcome provided by volunteer greeters begins the troops’ visit on a high note. DFW has assisted thousands of men and women since the first R&R flight arrived in November of 2004. Members of the community are invited to greet the arriving troops at the Airport and to continue this proud tradition of supporting the U.S. Armed Forces. Past participants include corporations, youth groups, schools, civic organizations, religious groups and individuals. Information on volunteering is available here or here. Information for members of the U.S. Armed Forces arriving at or departing from DFW Airport is available here. Information for families meeting or dropping off members of the military is available here. Information for community members who would like to greet members of the military is available here. Please visit the official Welcome Home A Hero Facebook Page for up-to-the-minute news and information on the volunteer program.